all bonds. Disengaged from bonds, he is no longer tied to the world. Such a person I describe as a brahmana. Uggasena, son of a rich man. 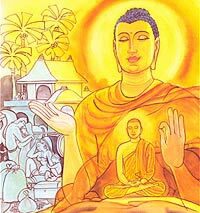 Buddha to accept him as a bhikkhu and was accordingly admitted into the Order. arahatship even then. So, they went to the Buddha and said, “Venerable Sir! attachment and is free from moral defilements. Story of Uggasena, Chapter XXIV.